The monument is composed of a sarcophagus base surmounted by an aedicule. A tablet of statuary marble is between the Ionic columns and surrounded by black marble. The final design is based upon a variant of drawing 16. 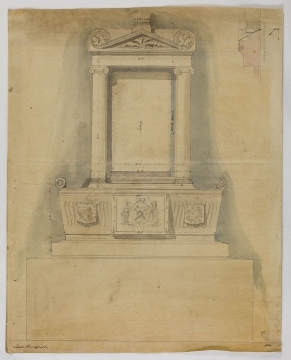 The principal alterations are at the ornamentation of the sarcophaugs with a course of strigillation, and the repositioning of the heraldic ornaments as suggested by Lady Bridport in her letter of 7 March 1816. Bridport's crest of a gull and anchor, surmounted by the Viscount's coronet and a ribbon bearing the motto 'STEADY', is placed on the apex of the pediment. On the sarcophagus the principal coat-of-arms, with the Viscount's coronet and the mottoes 'TRIA JUNCTA IN UNO' and 'STEADY' are placed in a label with the tab-shaped ends. On its left is the escutcheon bearing the West arms of Bridport's first wife, and on the right the arms of Bray and Sadler; Maria Sophia, his second wife, was the daughter of Thomas Bray. Drawing 23 shows the sarcophagus base as 5 feet 3 inches wide at its base and 5 feet 9 inches at the top. The aedicule measures 3 feet 6 inches across. The columns are 4 feet 1 and a half inches tall and the pediment is 1 foot 4 and a half inches tall. The entire monument sits on a plinth approximately 3 feet high. 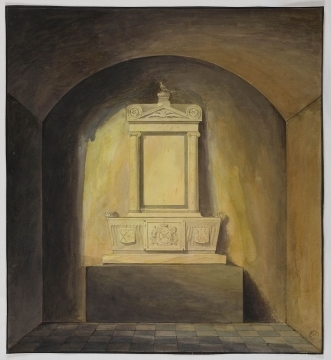 The presentation drawing (drawing 25) shows the white marble monument cast in a warm yellow light. It sits within a segmental-arched recess with a tiled floor. The monument has the Hood coat of arms in its centre and between two heraldic shields. The Cornish chough, another symbol of the Hood family, surmounts a coronet on top of the monument. The monument was placed in St Thomas's Church, close to Cricket Lodge. An undated bill states that the monument cost £310:14:4 (Priv. Corr. XIII.H.32). The bill shows that Soane charged £15, which is about a 5% commission. This low rate was probably a favour to Lady Bridport, as she and Eliza Soane had been good friends. Lady Bridport's letters from 1816 also refer to her strained financial situation (Priv. Corr. XIII.H.25). A bill from Thomas Grundy, marble mason, is dated 29 November 1816 (Priv. Corr. XIII.H.33), suggesting that the monument was complete before then.